The fundamental misunderstanding of Facebook’s mobile prospects is that it’s trying to compete with iOS and Android for in-app payment revenue via HTML5. It’s not. What Facebook really wants is the content produced by apps on every platform, which it can monetize with ads. Payments revenue is a very nice bonus, but not critical. That’s why Facebook announced today that it’s making money on mobile for everyone else by pouring traffic into their apps. Facebook says it drove 160 million visitors and 1.1 billion visits to third-party apps last month, up from 60 million visitors and 320 million visits in February. And now seven of the top 10 grossing iOS apps and six of the top Android apps integrate it to power discovery and virality. By showing that it can drive traffic to mobile apps, devs will keep integrating Facebook and sending it news feed stories that the social network show ads next to. Facebook has powered many of the big recent mobile success stories. The Flixster movie review and info mobile web app saw Facebook referral traffic soar to 480,000 hits a day, up 10x in the last four weeks. BranchOut released its Facebook-integrated professional networking mobile app 12 weeks ago, and has since seen its traffic boost from one million monthly active users to 12.5 million MAU. Apps like Viddy (now at 16 million registered users) and SocialCam have jetted to the top of the free charts thanks to traffic from their Facebook Timeline integrations. Viddy’s a perfect example for understanding Facebook’s mobile strategy. Facebook is promoting the app here even though it’s a native mobile app where the social network can’t make any money taxing in-app purchases. But that’s fine because instead, Viddy is sending tons of highly engaging video content to the Facebook news feeds and Timelines. 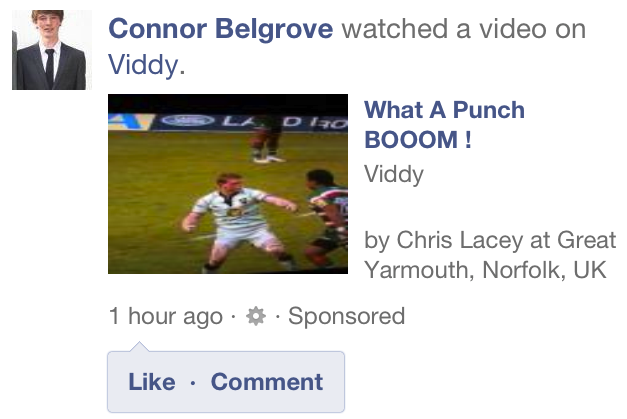 When users spend time on Facebook to watch Viddy videos, Facebook makes money on ads. And even as its user base shifts towards mobile, Facebook will still make money on ads. Sponsored Stories on mobile work. I know because I don’t mind seeing them, opposed to the obtrusive banner ads and instantly-scrolled-past sponsored Google search results you typically see on mobile. When old media like Forbes write that “[Facebook] has no idea how it will make money in mobile”, they reveal it’s them who are clueless. In fact, I think Facebook has one of the most enduring ad-based mobile monetization strategies out there because it’s managed to create ads we hardly notice but that still do their jobs — promoting the brands and apps your friends interact with. Imagine how much an app developers like Viddy are willing pay to show this Sponsored Story like that surely drive installs? The only thing Facebook needs to make that strategy work is a news feed that stays addictive. That’s why it wants to be social layer and data hub, not a traditional mobile platform. If it’s aggregating all the best content created by today’s top mobile apps, and filtering by relevancy to show stuff made by your friends, you can bet that years from now you’ll still have a reason to visit Facebook. Everyday. Like 500 million other people already do.